The blood vessels and nerves inside your teeth (the "pulp") are necessary to keep your teeth healthy and alive. If the pulp gets injured or infected, you'll need specialised treatment such as a root canal to preserve the tooth and prevent infection from spreading to surrounding tissues. In order to maintain a tooth that has either injured or infected nerve tissue a root canal is needed. During this procedure the inside of the tooth is completely cleaned, disinfected and sealed. To protect the tooth and maintain the seal, restoring the tooth with a crown is recommended. A tooth can develop a crack from injury or even just from chewing. A tooth that has had a root canal and is not restored with a crown has a higher risk of cracking. Cracked teeth can worsen, leading to infection or even the loss of the tooth. The chances of saving a cracked tooth are higher if the crack is caught early enough, so it's important to get your teeth checked regularly. 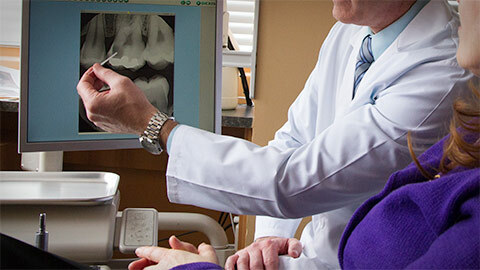 If you need more information about Endodontics (Root Canal Therapy) in Wolfville, contact us today.